Well, it’s not quite summertime yet, but the days are getting longer and the nights balmier, so we thought we’d give you a run-down on how to get as close to the water as possible during late spring and summer. We don’t have a beach, but this summer we can offer the next best thing. 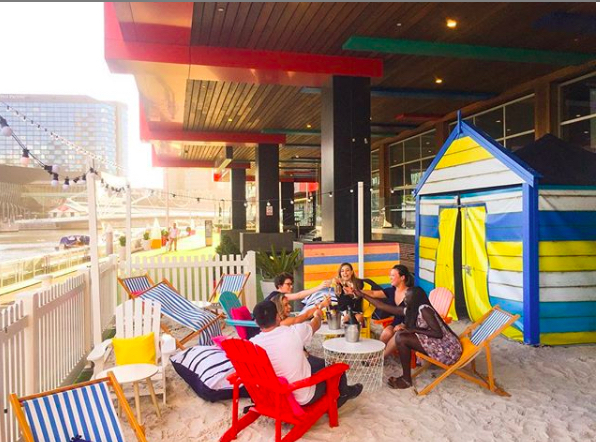 From the same crowd who brought you the igloos during winter, WTC Wharf and The Wharf Hotel have teamed-up again to bring you a strip of sand, beach umbrellas and beach boxes. Rest assured, they don’t have the Portsea or Brighton million dollar price tag. Infact, you can hire them by the hour or for the whole day. 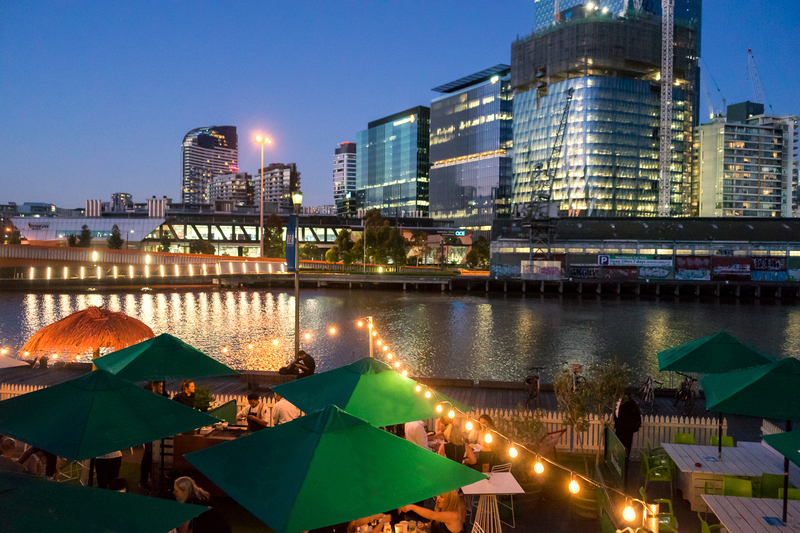 Just over the water at South Wharf, the Common Man Lawn area is in full swing again for the warmer weather, having been transformed into the Riverside Garden Pop-Up, complete, with white picket fence, astro turf, container bars, drink & bbq specials. Sip on Kahula espresso Martini's, summery cocktail jugs, Coopers beers, Squealing Pig Rosé in a can & wines plus feast on delicious BBQ specials. From January till the end of February, local film buffs can also enjoy the newest cinematic experience on Common Man’s green Astroturf, deck chairs, cocktails, a candy bar and a 6m x 3m screen made for movies. 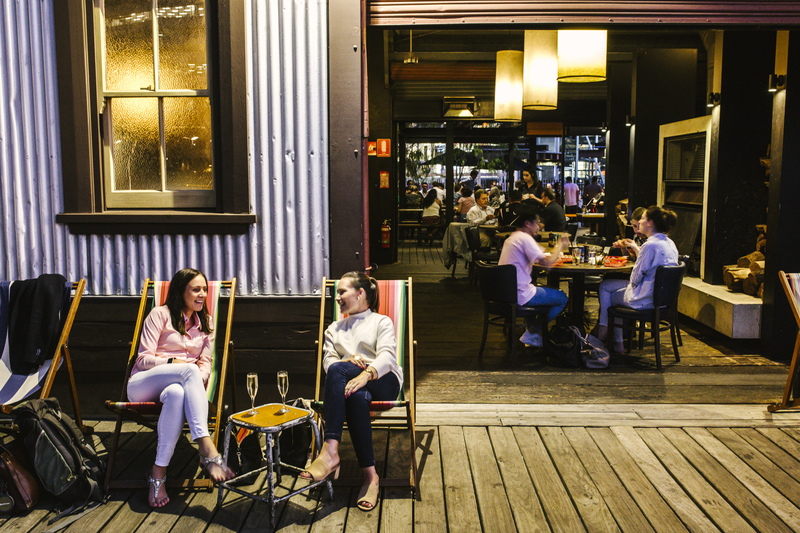 The Boatbuilders Yard on South Wharf Promenade is your quintessential outdoor summer bar. There’s plenty of tables and seating within the shadow of the mighty Polly Woodside tall ship, or on the city side of the venue, you feel as though you are part of the riverscape. If the weather becomes inclement, just head inside for some of the renowned Boaties indoor comfort. 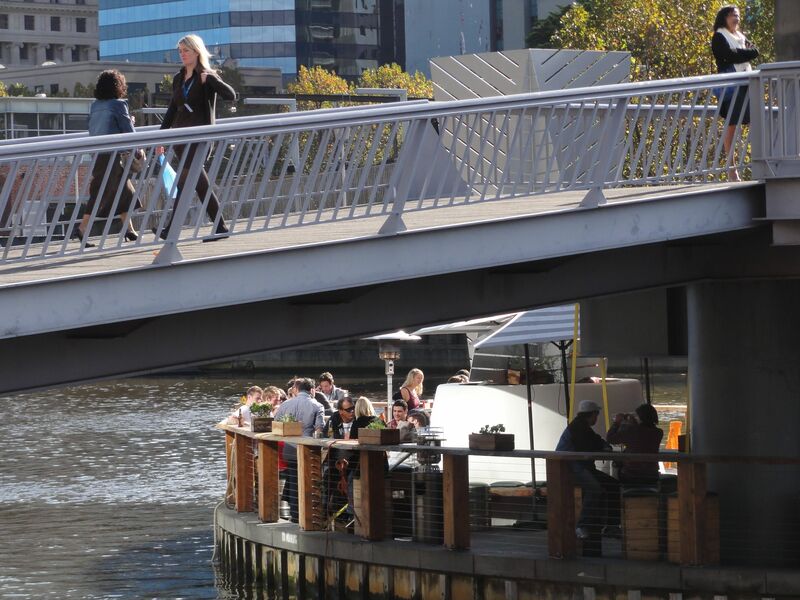 The people who started the whole riverside bar theme along the Yarra – Ponyfish Island – are still going strong. For the ultimate in waterside drinking and dining, then it doesn’t get any closer that this. In fact, you are virtually in the water, with the tour boats and rowing sculls circling all around you. Ponyfish has had a spruce-up in recent times, all ready for the summer onslaught. Still one of ‘the’ places in Melbourne to be seen. 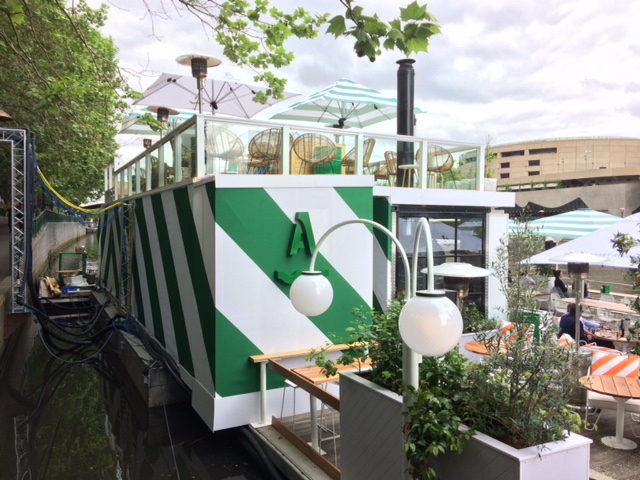 For the past two years, Arbory has extended its riverbank offering on Flinders Street station onto the water itself, to great acclaim by Melburnians and visitors alike. This season it has excelled itself, with a longer pontoon, really stylish décor and even an upstairs party area. Yes, the day beds are still available for those who want to get the weight off the legs (or for those who might become a little legless !). This year there is even a real orange grove sprinkled throughout the deck – very Mediterranean. 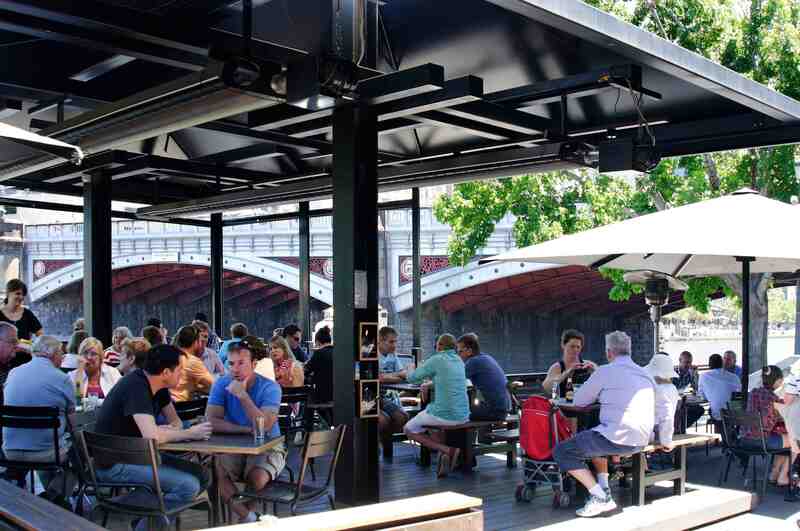 An old favourite, Riverland Bar just below Fed Square, enjoys a lovely shady environment on hot summer days. The historic bluestone vaults, in the shadow of the beautiful Princes Bridge, is sooo Melbourne, but with the very latest in food and beverage. Riverland Bar runs almost seamlessly into Pilgrim Bar, providing 100 metres of contiguous riverside enjoyment.